The name Brunello di Montalcino DOCG includes two types of wine: Brunello di Montalcino DOCG Brunello di Montalcino Riserva DOCG both produced from Sangiovese grapes grown exclusively in the area limited to the municipality of Montalcino in the province of Siena. Brunello di Montalcino DOCG is a visually limpid, brilliant wine, of an intense ruby color, tending to garnet with aging. It has an intense, persistent, ample and ethereal scent. The hints of undergrowth, aromatic wood, small fruits, light vanilla and composite jam can be recognized. To the taste the wine has an elegant and harmonious body. Thanks to its characteristics, this wine endures long aging, improving over time. This wine can be kept for a minimum of ten to thirty years, but in particular conditions it is able to be stored in the cellar for even longer times. The vocation of this territory to the production of wines of great quality is already known from antiquity. In fact, already in the medieval period, the municipal statutes regulate the start date of the harvests. 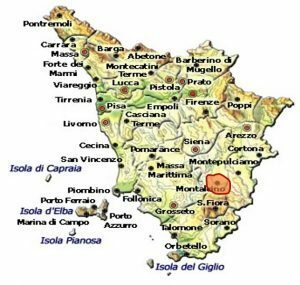 Already Leandro Alberti (1550-1631) described the village of Montalcino as "much named for the good wines that are taken from those pleasant hills ...". The precursor of the production of Brunello di Montalcino wine as we understand it today, however, was Clemente Santi. In 1869 one of his 1865 Selected Wine (Brunello) wines was awarded the silver medal by the district's Comice. In 1893 the Ministry of Agriculture awarded a wine by Raffaello Padelletti and at the beginning of 1900 Brunello di Riccardo Paccagnini won many very prestigious national and international awards. Thanks to the organic substance poverty of the cultivation lands and the relative lack of water, they allow the Sangiovese vine to develop with rather contained vigor with consequent limited production. Also the climate influences the vine and its development during the vegetative phase of the vine that goes from mid-April to mid-September. The spring rains favor the accumulation of water in the root system in order to favor the first phase of vegetation. Subsequently, in the summer months, the plant has a progressive vegetative slowdown, given that the land tends to lose more and more water reserves due to the low rainfall in the area. The following period, that is, the beginning of autumn is fresh, so that during the ripening of the grapes, there are both for position and altitude, significant temperature variations between day and night.